If you are looking for the golf holiday of a lifetime or perhaps just something different then our Dyeabolical Golf Trail fits the bill. The South East Coast of the USA is home to some of the great golf destinations and with only around 8 hours drive between Myrtle Beach in the north and Sawgrass in the south, you can spend more time playing golf and less time driving. The minimum itinerary we suggest is 12 nights with 8 rounds of golf but we can add in any additional rounds and nights on request. The Dyeabolical Golf Trail takes in 7 classic Pete Dye designs including such famous names as the Ocean Course Kiawah, Harbour Town Golf Links and the TPC Stadium Course at Sawgrass, home of the Players Championship. you can fly into Myrtle Beach Airport (MYR) or it is less than four hours drive from either Charlotte (CLT) or Raleigh / Durham (RDU) International Airports. The tour starts off in Myrtle Beach with a round at the Dye Club on Barefoot Resort, a challenging links style layout which has tested both amateurs and pros alike since it opened in the 1990’s. The pro-am ‘Monday after the Masters’ is held there each year. The second course of the Myrtle Beach leg is one of our personal favourites, Prestwick Country Club. A wonderful course, designed by Pete and P.B. Dye, which offers great variety with a combination of tight tree-lined holes and more open, almost links like terrain it is a joy to play and recognised as one of the toughest courses in the area. Accommodation would be a minimum 3 nights at Barefoot Resort and Golf in a resort villa, upgrades to waterway apartments are available on request or we can suggest an alternative resort if you wish. Next you would move on to Kiawah Island Resort to play the world famous Ocean Course which has hosted many important golf events over the years including the 1991 ‘War on the Shore’ Ryder Cup, World Cup of Golf and 2012 PGA Championship won by Rory McIlroy. Ranked the number one toughest course in America, when the wind blows it is a serious challenge. It is about a 3.5 hour drive from Barefoot Resort to Kiawah so you would arrive mid afternoon. 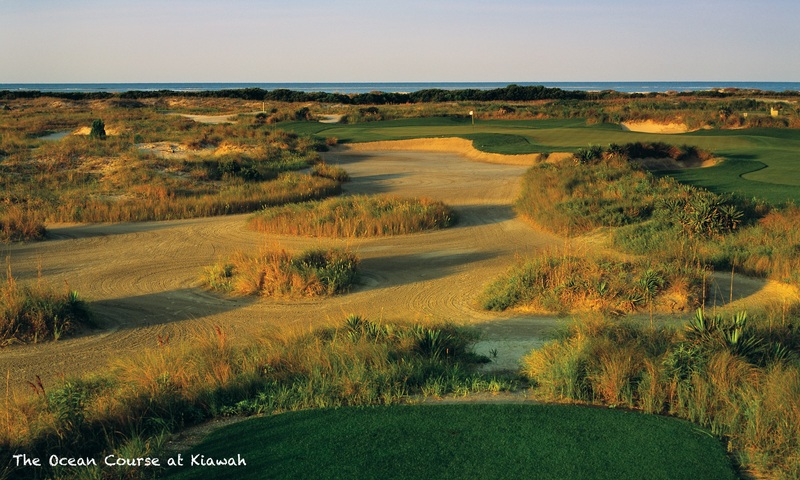 A stay at Kiawah requires a minimum of two nights accommodation, we recommend 3 nights, and two rounds of golf so you can either play two rounds on the Ocean Course or play one of the other resort courses. Choose from Turtle Point, Osprey Point or Cougar Point. Accommodation would be in a deluxe resort view villa on Kiawah Island Resort. Upgrades to ocean view villas or the five star Sanctuary Hotel available on request. The third leg of the trail involves a stay at Sea Pines Resort on Hilton Head Island which as around 2.5 hours drive south of Kiawah. Your stay would start with a round on the new Dye designed Heron Point which is a seriously challenging layout with small greens and deep run off areas and bunkers. The second round would be on Harbour Town Golf Links, one of the most respected venues on the PGA Tour, hosting the Heritage Tournament each year, the week after the US Masters. Accommodation would be in a resort or golf view villa for a minimum of 3 nights. Many upgrades available on request including the boutique style Inn & Club at Harbour Town with a room overlooking the 1st hole. The final leg takes you to the Marriott Sawgrass Resort in Ponte Vedra Beach Florida. Two more rounds here. The first round is on the TPC Dye Valley course which offers you a gentler test in preparation for the grand finale on the TPC Stadium Course, home of the Players Championship, the so called ‘5th major’, on the PGA Tour. There is something satisfying about playing a course where the pros have played so to play three of the very top courses in one trip of a lifetime makes the Dyeabolical Golf Trail a very special and memorable golf experience. Accommodation would be for 3 nights at the Marriott Sawgrass Resort. Additional nights and rounds can be added on request. This is a completely custom, non escorted tour so we can arrange it for you whenever you would like to go. There are some date restrictions due to tournaments, course maintenance and so forth so be prepared to be a little flexible with your dates. Most issues fall in April and May with Monday after the Masters at Barefoot Dye Club, the Heritage Tournament at Hilton Head the week after the Masters and the Players Championship at Sawgrass in May but we can usually work around the scheduling without too much trouble. We can provide a number of options in the Myrtle Beach area if you don’t want to stay at Barefoot. The best value would be the villas at Kingston Plantation, while for couples looking for something a bit more upscale we would recommend either Embassy Suites at Kingston Plantation or the superb Marina Inn at Grande Dunes. Check out our Myrtle Beach Accommodation page for more details. On Kiawah Island Resort you can either stay in the villas which are quite reasonable for such a high profile resort or, for the ultimate in luxury, the five star Sanctuary ocean front hotel. 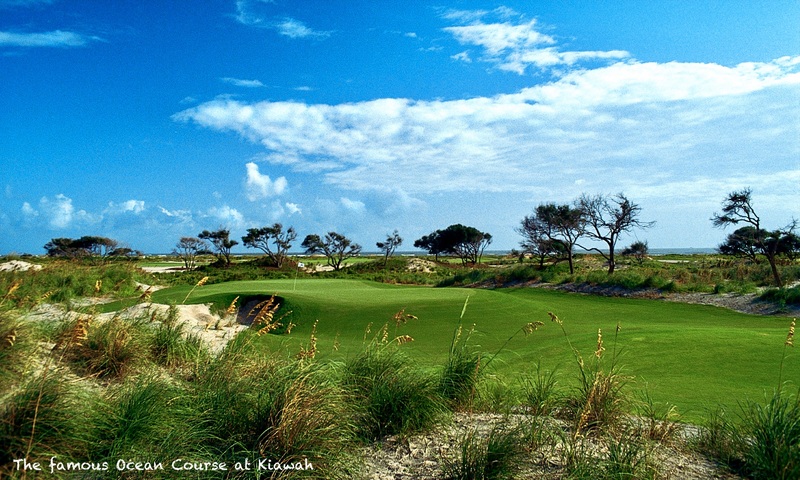 See our Kiawah Island Resort pages for more information. Similarly, on Sea Pines Resort in Hilton Head you can stay in a villa or the luxury ‘boutique style’ Inn & Club at Harbour Town, one of our very favourite hotels. Find out more on our Sea Pines Resort pages. Finally in Sawgrass you would stay at the Marriott Sawgrass Resort where they have a range of guest rooms, suites and 1 and 2 bedroom villas to choose from. Number of nights is up to you. We recommend 12 nights accommodation with 8 rounds of golf as a minimum. We can also add in extra golf and extra nights as required so it really is up to you. Just let us know how many nights, how many rounds and the makeup of your party and let us take care of the rest. We can even add in extra destinations if you wish with both Pawleys Island and Charleston situated between Myrtle Beach and Kiawah. Our car rental contract allows for different pickup and drop off points so for this tour you would ideally fly into Myrtle Beach (MYR) and out of Jacksonville (JAX). There are a number of other airports which you can fly into to help make your trip easier and we would be happy to put you in touch with our preferred flight agent to help you arrange this. See our Car Rental and USA Flights pages for more information.